Millions of people would agree we live in an uncertain world, particularly when it comes to Israel. Given the number of forces working against the tiny Jewish state, it might seem the country has no future at all. Iran recently backed up its almost daily oath to obliterate Israel when it launched a barrage of missiles designed to demonstrate its capability to destroy U.S. bases in the region, along with the Jewish state, in a matter of minutes. Such an attack could conceivably kill 6 million Israelis and more than 1 million Palestinians at one fell swoop. The Israel Defense Forces reports that, since Israel withdrew from the Gaza Strip in August 2005, more than 8,000 rockets have been fired into Israeli towns and villages. In 2011 alone, 627 rockets from Gaza hit Israeli towns. They are aimed at schools, kindergartens, and homes. Many Israelis are being injured, and most children in rocketed areas now suffer from trauma. Regarding Egypt, almost no news is good news. The new president, Mohammed Mursi, is a member of the radical Muslim Brotherhood, which is quickly gaining control of the country. Indicative of the developing turmoil was a June assault on vehicles carrying Israelis working on a border fence. The attackers crossed into Israel from the Sinai. One Israeli was killed. Following the attack, rockets were fired from the Sinai into southern Israel, raising concerns about both the security on Israel’s border with Egypt and the survival of the 1979 peace treaty made by late Egyptian President Anwar Sadat and maintained by ousted President Hosni Mubarak. To make matters worse, the UN Human Rights Council has passed five more anti-Israel resolutions condemning the nation that holds perhaps the best human rights record on the planet. Yet the Council criticized Israel for everything from the so-called oppression of Palestinians to defending itself while under terrorist attack. Furthermore, another resolution denies Israel’s basic right to self-defense. For good measure, the Council created a mission to investigate Israeli housing in the West Bank (Judea and Samaria) and Jerusalem. How many times have the Jewish people been pronounced dead and gone? Almost too many to count. Yet Israel is alive, well, and back in its land. Israel’s triumphs frustrate all of God’s enemies. So they press on, hoping for one last chance to do the Devil’s work and bury the God of the universe with His Chosen People. Those of us who know the truth have been given the privilege of witnessing and participating in the greatest drama in the history of the world. Seeing God’s Word being fulfilled before our eyes strengthens my faith, revives my spirit, and reminds me that every effort we make to teach the Scriptures is worth it. I am profoundly encouraged when I realize so many of you have the same commitment as The Friends of Israel and you have come alongside to carry on the mandate to make His truth known. From The Friends of Israel Gospel Ministry Inc. For more information about F.O.I. write to: P.O. Box 908 – Bellmawr, NJ 08099 or call 1-800-257-7843. You can also reach F.O.I. 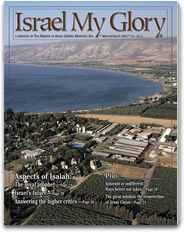 online at: foi.org to receive a 1 year free subscription of F.O.I.’s magazine Israel My Glory.